A Sagittarius person will find that by focusing more intently on particular chakras, that their healing will be increased, as they vibrate at a higher intensity with these chakras. The Solar Plexus Chakra is used by Sagittarius people to increase and balance their desires and self love. This chakra will also encourage an increase in your self esteem and personal will in a constructive manner. 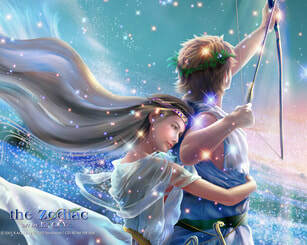 Self empowerment, honour and assuming responsibility will also help Sagittarius achieve their desired results in life. The Throat Chakra encourages creativity, intention and a higher will for a Sagittarius who wishes to make the arts and humanities their future. This chakra encourages and increases your communication skills, faith in yourself and others. It builds a desire for knowledge and choice. Sagittarians will be able to see and speak the truth of a thing or situation with the unblocking and balancing of this chakra. The Third Eye Chakra is used to be able to see and speak your truth. It encourages awareness of yourself and your surroundings. Sagittarius people will benefit from opening and balancing the third eye chakra to accept and use your intelligence and imagination. The Crown Chakra is used to help you to enjoy the silence around and within you so that you can hear the truth and seek enlightenment. This chakra encourages inspiration from within and helps create bliss in your life. It encourages you to be conscious of the need for unity. Attributes - Falcons Eye is red tiger eye and it will help you be more composed and reserved in stressful situations. It enables you to quickly understand situations that need well planned actions. Falcons Eye relieves pain; regulates the adrenal glands and helps with acute asthma attacks. Message - I fought for freedom, rights, and have defended peace. Focus - People appreciate your point of view and company, particularly those who share your passion and interests. Affirmation - I remember, lest I forget. Attributes - White agate is the stone that brings calm, peace and self confidence into you life. Use this stone for meditation as it will ease the path to the higher plane. It enhances your composure; it aids kindness, sincerity and looking on the lighter side of life. If you need to be more tolerant and understanding white agate is the ideal stone. Physically falcons eye is for the eyes, brain, skin, lymph glands and tissues; It is a protective stone during pregnancy. Message - The continuous swelling of energy and emotion. Focus - You are cheerful and lively, attracting unusual and eccentric friends and pastimes. Affirmation - I seek adventure and freedom. Attributes - African Jade will help you if you need to be more aware and alert of your surroundings. It will help you see any unwanted external influences on your life; it will help keep you calm in times of great stress. African Jade encourages you to take responsibility for all your actions. Physically African jade helps with cleansing and eliminating toxins from the body. It strengthens the stomach, liver and intestines. Message - Balance, stability, perfection, strategy and success. Focus - Accurate intuition and an analytical mind give you a distinct advantage in life. Affirmation - I am gifted with many unique talents. Attributes - Gaspeite is a life affirming stone that makes you aware of the joy that can be obtained by just being alive. This stone lifts your mood and can make you feel more benevolent toward yourself and others. Be aware though that if used to much, gaspeite can make you self critical. It will help with the agility of your mind and body. Physically gaspeite helps with detoxification. Message - Moving forward with distinctive style and determination. Focus - Caring and trustworthy, you charmingly express your individualism while supporting the best in others. Affirmation - I am an extraordinary individual. Attributes - Opal wood fossil is a life affirming stone. It helps you become more open and lively around others. This stone gives you and unshakable inner harmony. Use this stone when you wish to see the pleasant and positive side of life. Opal wood fossil gives you a healthy appetite and aids digestion. Message - Familiar awareness, daily virtue and traditional wisdom. Focus - You are an enthusiastic and inspirational teacher; you learn much through life experience. Affirmation - I am a keen observer of life. Attributes - Blue aventurine helps you be calm and relaxed in your life. It relieves nervousness. Blue aventurine will help you approach your tasks and other stressful situations with a calm attitude. This stone eases pain and chronic stiffness and has a cooling effect on the body and it reduces fever. Message - Exceptional refinement, courage and temperament. Focus - A team player, you fit in well with groups of people and you know how to have fun. Affirmation - I respect fair play and excellence. Message - Fervent vitality, sensual devotion, playful ardour. Focus - Attractive and with charismatic charm, you draw positive attention from many people. Affirmation - I invite love into my life. Attributes - Mahogany obsidian is a stone that will help increase you drive, brings you power and initiative. It removes feeling of dismay from insults, disparaging comments and false accusations. It improves your blood flow in the body; warms your limbs and helps to stop bleeding. This stone also will help with wound healing. Message - Synthesise, crystallise, integrate, brings structure into existence. Focus - You love being intimately involved in nature, enjoying and observing natural forces. Affirmation - Earth, air, fire and water elements support me in my life. Attributes - Lavender jade awakens spirituality; works slowly to prevent work overload; it eases fear of psychic or spiritual opening and puts you on the spiritual path. It is traditionally used for good luck and good fortune, peace, health, prosperity and protection from misfortune and accidents. Message - Transformation, upward movement, light and achievement. Focus - You have a deep enjoyment of loving, teaching, and playing with children. Affirmation - I help others; I am kind and caring. Attributes - Yellow sapphire increases your spiritual energy. It intensifies your commitment to your life's purpose. It will help you achieve abundance and prosperity. It heals depression, lack of energy and chronic exhaustion. Message - Blessings and kindness make for an easier path to follow. Focus - Fortunate opportunities will lead toward an increase in money, fame or promotion in your life. Affirmation - I invite abundance and prosperity into my life. Attributes - Alabaster encourages you to set boundaries and find stability in your life. It stabilises your psychic state and will protect you if you are a highly sensitive person. Alabaster encourages self control. With this stone you will be able to consciously recognise old patterns of behaviour and it will encourage to to break them. Physically it firms up tissues and loosens hardened muscles, this should only be done for a short time through your meditation or healing sessions. Message - Spiritual thinking and meditation leading to physical growth and ascension. Focus - Spiritually motivated, you understand and respect all points of view and see they all have a place in the Divine. Affirmation - The Divine within me honours the Divine in you. Attributes - Diopside will help you to let go of old unproductive feelings and thought patterns and help you forgive yourself. It will help you ease old emotional and physical pain and wounds. When you need to make peace with others after a dispute this is the stone to wear. Physically diopside helps the kidneys, hormones and acid/alkali balance. Message - Signs and messages transforming in sound and vision. Focus - You are an inspirational leader with a desire for exploration and adventure; you lead by example. Affirmation - I am adaptable. Attributes - Yellow calcite increases your self esteem and will increase your sense of security. It will make you stronger in situations of dispute so that you will be able to calmly get your point across to others. It stimulates food digestion, assimilation and metabolism. It strengthens the skin, bones and teeth. Message - Empowerment, renewed self-confidence, restoration of personal power. Focus - Your empathetic counselling abilities lead to healing, forgiveness, and release of pain. Affirmation - I move decisively forward into the light. Attributes - Lapis Lazuli is the stone for urging you to be truthful, honest, trustworthy. This stone enhances all forms of communication. It encourages friendships and sociability with others. It is a stone that lends you dignity. Lapis Lazuli is a stone that will helps problems of the throat, larynx, vocal chords, nerves and brain. It regulates the thyroid gland. Message - Raise your vibration; align yourself with your higher purpose. Focus - You are officially recognised in an important capacity due to the valuable insights you communicate. Affirmation - I am a living reminder that great symbols endure. Attributes - Siderite is a stone that will help you in being firm in your decisions and actions. It will lend you patience and strength in the face of difficult decisions and situations. In times of stress and harassment siderite will help you remain calm and forthright. Siderite will stop you brooding over being wronged. Physically it is good for the heart, circulation and iron metabolism. Siderite is a specimen only, crystal as they are small and occur on other crystals such as calcite, amethyst, pyrite etc. Message - Comfort is found freely in faith, hope and love. Focus - You see meaning in symbols and signs; you ‘forecast’ and anticipate many outcomes accurately. Affirmation - I am a natural visionary.